The all-in-one music system is hardly new. Devices like the Arcam Solo Mini have shown that the electronics can be miniaturised and integrated with remarkably little quality loss. 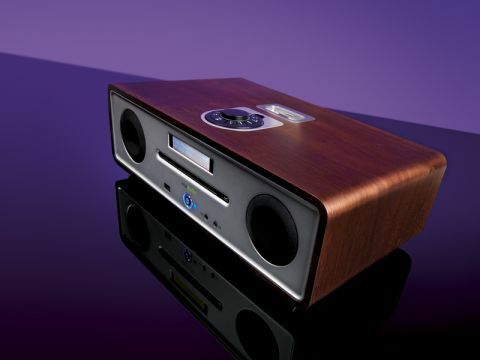 But with the R4, Vita Audio has gone one better and built the speakers into the box too. Can this neat unit follow the success of the R1 and R2 table radios? Neat it may be, but it's quite large – you'll not quite lose it in a corner of the kitchen counter. Then again, it does include not just two, but three loudspeakers. There's a subwoofer in the bass, driven by its own power amplifier and relieving the small left and right channel drivers of the need to move large amounts of air. Said subwoofer is aided by a reflex port and a susprisingly generous amount of internal space: Vita has partitioned the unit internally, so that each drive unit has its own space in which to move. There are plenty of sources available. DAB and FM radio are built-in, as is a slot-loading CD drive which, in addition to regular music CDs, plays MP3 and WMA discs. A USB socket on the front caters for generic portable music players, while iPods can connect to the dock on the top. A line input allows connection of your favourite retro source. If you've seen previous Vita products you'll recognise the general layout of the control knob and switches at the top of the unit. With the R4, though, that whole assembly lifts out and reveals itself as one of the coolest remote controls we've yet seen – it really looks as if it should have a button marked 'beam me up, Scotty'. There's one potentially serious drawback here, however, this remote is the only way of controlling every function except on and off and it uses a slightly obscure battery size, AAAA (four-A) as the power supply. Let the batteries run flat and you can't even play a disc or switch the alarm off (yes, it has full alarm and sleep functions) until you've visited your local electronics store for replacements. So always keep spares! Maybe we shouldn't admit this, but we found ourselves doing most of our listening to the R4 with its '3D sound' function switched on. It seems to be the usual enhanced stereo kind of thing, but it just brings the sound to life in a thoroughly pleasing way. Without it, there is a sense of instruments struggling to get out of the box. Mind you, we've heard more of a struggle with quite a few sub-£100 separate speakers. Although the sound has clearly been balanced for general room-filling and, as a result, is a little bright if one sits directly in front of the speakers, the balance from the R4 is generally lifelike and full-bodied. More importantly, it can produce a decent sense of scale and dynamics in a performance (even in a fair-sized room). And if you're listening at low volume, then the well-judged 'Loudness' function helps. But turn up the wick and there's plenty of life and energy. Bass has a nice snap to it and voices are crystal clear and communicative. There are limits to what a system like this can achieve and we're certainly not about to dispose of any hi-fi separates on account of it, but if you have a use for a smart, low-hassle system in your spare bedroom or kitchen you probably can't do much better than this.